Pacific Medical Buildings (PMB) is pleased to announce its selection by Sutter Health/CPMC to develop a $168 million, nine-story, 250,000 square foot medical office building (MOB). The MOB will be located on the new California Pacific Medical Center (CPMC) campus at Van Ness Ave. and Geary Street in San Francisco. The Sutter Van Ness MOB (SVNMOB) is part of an overall development plan that includes a new 700,000 square foot acute care hospital with underground parking. The MOB project is a joint venture with Ventas Inc., a Chicago-based real estate investment trust and PMB. The MOB will be connected to the new $2 billion, 274-private bed inpatient only facility through a pedestrian tunnel below Van Ness Avenue. Construction of the hospital has commenced and is expected to be complete with the first patients being seen in 2019. PMB anticipates commencing construction of the MOB in the first quarter of 2015 and expects to open the MOB concurrently with the completion of the hospital in late 2018. PMB will construct a six-level, 383-space subterranean parking structure as part of the project. Sutter will own and operate the parking garage. The architect for the SVNMOB is Boulder Associates, a leader and innovator in sustainable healthcare design. The project's general contractor is Pankow Construction. The MOB will be LEED (Leadership in Energy and Environmental Design) Silver certified. LEED certification is an internationally recognized verification that a facility meets the green building, design, construction, operation and maintenance standards developed by the U.S. Green Building Council. "We are delighted to be working with Sutter Health again" says Mark Toothacre, President of PMB. "This is an exciting project for us and we are privileged to be a part of the new medical center campus. The centralized location of the new campus will significantly enhance the ability of San Franciscans to obtain needed medical care even after a major seismic event. PMB looks forward to partnering with Sutter and CPMC as they continue to grow and innovate to meet the medical needs of the city." The MOB will be 50 percent pre-leased and occupied by California Pacific Medical Center and the Sutter Pacific Medical Foundation, both Sutter-affiliated entities. The facility will accommodate physician offices and other related ambulatory care medical uses. The second and third floors of the SVNMOB are designed to OSHPD 3 standards. Independent private practice physicians will be offered the opportunity to lease space and invest in the new SVNMOB. Sutter Health is one of the nation's leading not-for-profit networks of community-based healthcare providers, delivering high-quality care in more than 100 northern California communities. Sutter Health supports more than two dozen locally run acute care hospitals as well as physician organizations; medical research facilities; regionwide home health, hospice and occupational health networks; and long-term care centers. The Sutter Health network is also the regional leader in infant deliveries, neonatology, orthopedics, pediatrics and cancer care services. California Pacific Medical Center is one of the largest private, not-for-profit, academic medical centers in California and is a Sutter Health affiliate. CPMC is made up of four of the oldest medical centers in San Francisco, consisting of the California Campus, Pacific Campus, Davies Campus, and St. Luke's Campus. 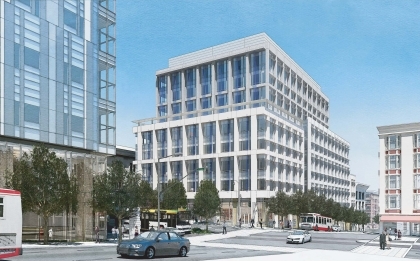 CPMC is proposing several major changes to its existing four-campus health system, which will not occur until the new Van Ness and Geary Campus is complete.